Mozzarella cheese and bacon bits plus up the flavour in this incredibly easy oven-baked omelette. 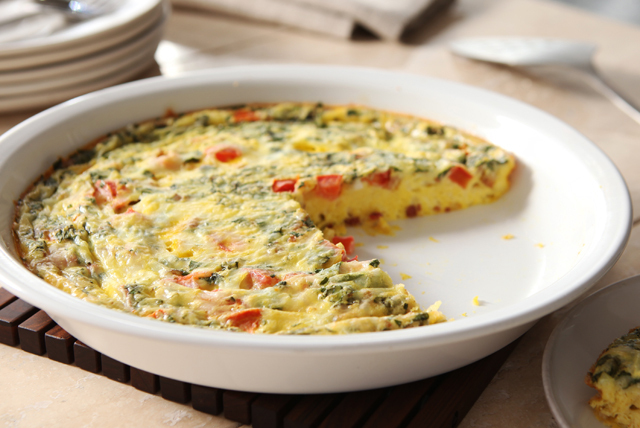 Our Easy Oven Frittata is perfect to serve as part of your breakfast, brunch, lunch or light dinner. Whisk eggs and water in medium bowl until blended. Add tomatoes, basil, bacon bits and 1/2 cup cheese; mix well. Pour into 9-inch pie plate sprayed with cooking spray; sprinkle with remaining cheese. Bake 30 min. or until puffed and golden brown. A frittata is a great way to use those leftover vegetables and cheeses in your refrigerator. Be creative and don't be afraid to try something new! Prepare as directed, substituting Cracker Barrel Shredded Old Cheddar Cheese for the mozzarella, 1/2 cup cooked sliced mushrooms for the bacon bits, and 1/2 cup cooked chopped spinach for the basil.